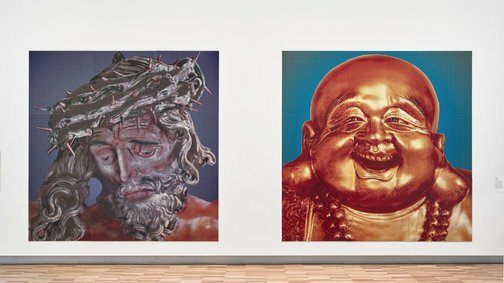 'In this subtle and insightful work, each larger-than-life image proves on close inspection to be composed of digitally produced images of the other: Christ is created from tiny figures of Buddha and the Buddha from tiny images of Christ. There are 22,500 smaller figures in each large figure. The Buddha is in fact the so-called 'Laughing Buddha', a historical figure called Budai who also became synonymous with the Future Buddha Maitreya. Budai was an eccentric pot-bellied Chinese monk easily recognisable by his enormous smile and the large cloth bag he always carried. Budai was revered as an enlightened being, detached from the cares that bind the rest of us. He became associated with Maitreya because of his supramundane character and because of a famous poem he wrote on his deathbed that implied that he was Maitreya in disguise. Dinah and Michael Dysart, Art and Australia (Vol. 41, No. 4) , 'Asian Galleries. Art Gallery of New South Wales', pg. 541-543, Sydney, Jun 2004-Aug 2004, 541, 542 (colour illus. ), 543. Peter Hill, Photofile 59 , 'Passing Time: Photography at the Moet & Chandon Exhibition 2000' Reviewed, pg.59, Sydney, Apr 2000, 59. Victoria Lynn, Moet & Chandon Exhibition 2000 - Passing Time , 'Xian Xian Liu', Sydney, 2000, (colour illus.) Not paginated. John McDonald, The Australian Financial Review Magazine , 'The cultural revolution', pg. 18-26, Sydney, Dec 2002, 21 (colour illus.). The Asian Collections Art Gallery of New South Wales , 'The Shanghai School and Modern Painting', Sydney, 2003, 181 (colour illus. ).